Widespread and common year-round resident. A small, relatively easy falcon to see in Northern Ireland. Adult male has a grey head and unbarred grey tail, rufous back and upper wings marked with dark diamond-shaped spots contrast with dark wingtips. Underparts are pale with bold spotting. A strong ‘moustache’ marking. Adult females lack the grey markings and the tail is finely barred. Commonly seen hovering with splayed tail hunting for small mammals, insects and occasionally small birds. 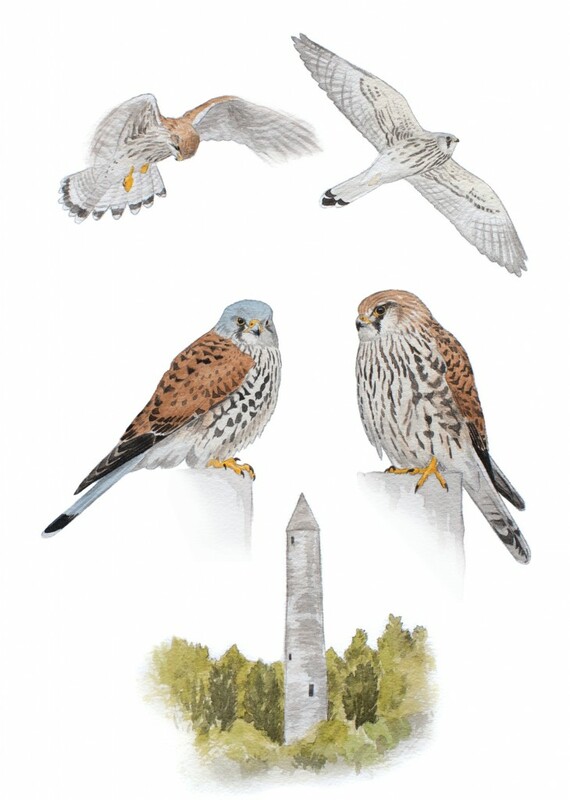 Prey detection is aided by the kestrel’s ability to see in ultraviolet light, so it can view urine trails left by small rodents moving through vegetation. Found in a variety of open habitats including farmland, moorland, coasts, wetlands, roadside verges and parks. Nests on cliffs, buidings and in forests using cavities, ledges or old crow nests. Readily takes to artificial nest boxes.